› Tracking down old owners? Which of you have had success in finding old owners of their cars and learning about the history of it? Every time I sit in my car I feel like I'm stepping into a time machine, and I wonder...how many people have owned my car, what did they use it for, did anything interesting happen to them in it, etc. etc.... 1 owner or 2 owner cars are easy, but what if your car has had 5 owners? or 10?? Was it their first car? Did they buy it for their kids graduation present? did they sell because they needed a station wagon/grocery getter?? These cars aren't getting any younger, and neither are the people who would have originally purchased them. I also stopped in the local DMV (and called the main office in St. Paul), but they cant help me at all because of privacy laws. So, I sent the old owner a text thanking him for the help, telling him what happened, and kindly asked him to let me know if he ever remembers anything else... and frustratingly began typing out this thread. No kidding, as I am typing this out; the old owner calls my cell phone. The rusty gears of 15 year old memory broke loose, and he now remembers that he bought the car from a guy a couple towns north of me who works at the local bank. This guy evidently bought a few old cars back then and sold the Mustang to my guy because he knew he liked old cars. So I call this bank up, tell the lady who answers my story...and...and...Yes! He does still work there and is now in fact the president of the bank. She was very helpful and she actually seemed pretty interested in my story... so she takes my name and number, and said she will pass it on to the boss man (who was not there today) and have him call me back! That's where I'm at. 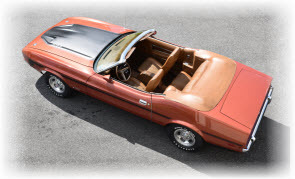 When I started typing this I was dejected and hopeless figuring the details of my Mustang's past were lost to history, and now I am cautiously optimistic that I will have another breakthrough that leads me further down the path of my cars infancy. Ill update this as I find more! How about you folks? Have you made an attempt to find out the details of your car? What did you find when you started poking around? What have you found works best for doing research? I'd love to hear any suggestions anyone may have, and would love to hear any stories of your research. I have had little success in tracking down previous owners, except for the guy (now deceased) I bought it from back in 1995 and the car's very first owner. I know who the first owner was from a piece of information contained on the original invoice. Initially, my car was owned by the Ford Marketing Division and provided to a Ford employee for company business purposes (commonly called a Ford Marketing Car). I know little about the first "owner", a Ford Employee named H. Hartman, who I suspect worked at the Ford Delaware Valley PDC in Pennsauken, NJ where the car was delivered according to the invoice. Interesting it was delivered to the company's P.O. Box according to the invoice. That must have been a very big P.O. box! I have never been able to track the Ford employee or any other owner down. Once while tearing the car apart restoring it, I thought I had a lead when I found an old credit card gas receipt from a few years prior to me buying the car, it had the woman's name and the town for the service station, I was able to google the woman and locate her current address. I wrote her with pictures of the car and her receipt, but she never responded, so I dropped it, not wanting to be accused of stalking. Cool story, and sounds like you are doing a great job of tracking your car's history! I hope it works out and you can track it all down. Sometimes goodies can come out, such as an original owner's manual or warranty card, which would be seriously cool!! 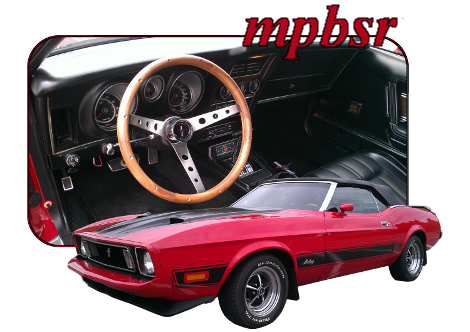 I am mostly in the dark about my Mach 1's history. The guy I got it from bought it at a Mecum auction and was not real helpful in tracking previous owner or missing documentation. The original invoice has already been bought by someone else, and the Marti people were no help in helping me locate where it went. They say they don't have records...but...their business IS SELLING RECORDS! I don't buy it! They just don't wanna give me a name is all. Put my VIN number into Google, and low and behold, 100 pictures of my car come up, apparently right after it had been restored. There it is, original invoice, warranty card, everything!!!! Who in the **** keeps this kind of stuff and doesn't let it go with the car?? It more than ticks me off to say the least. I'm pretty well stuck, so I'd love to hear other people's stories, maybe it would help me! I've had good success in tracking things back to the first owner of my car and the one after that who had it for many years. I called both and learned some things about the vehicle although neither guy was particularly talkative. The original owners current wife spoke with me for a while and of all things...she was going through the photos from his previous marriage when I called. She was looking at several pictures of the original owner with the car from 1973. She sent me them as she was just going to throw them out. I also found a receipt for some engine work that was done about a decade ago and called a small repair shop in Alabama who was able to give me more information about the work and I later called the engine rebuild shop as well. I was able to track mine back to 2006. Called the guy who had it then. He had it for about 8 years. Said he purchased it sight unseen from California and didn't remember or have any records on it. (06-12-2018, 08:11 AM)Twins Wrote: I've had good success in tracking things back to the first owner of my car and the one after that who had it for many years. I called both and learned some things about the vehicle although neither guy was particularly talkative. The original owners current wife spoke with me for a while and of all things...she was going through the photos from his previous marriage when I called. She was looking at several pictures of the original owner with the car from 1973. She sent me them as she was just going to throw them out. I also found a receipt for some engine work that was done about a decade ago and called a small repair shop in Alabama who was able to give me more information about the work and I later called the engine rebuild shop as well. That's really cool that she sent you those pics. I would love to be lucky enough to get back to owner no.1, but I'm just taking it one step at a time... When I get my car back from the shop I'm going to try to find that build sheet and give the car a thorough searching, maybe I'll get lucky and find and old clue as well. Still have your carb on it BTW, it ran with it but still having that same issue.... hoping the shop will be able to figure it out for me. I thought that was you with the carb! Hopefully, they get it squared away and you get that baby on the road. As far as finding out data...all it takes is one clue and you pull on that thread until you get the next one. Obviously, in the age of the internet this has become easier than before. If all else fails you might want to put a picture of the car and some info on something like Facebook and see if anyone knows anything. Good luck as you continue to search the history of your car. I too get intrigued about who had my cars before me and what path they took to get here. I guess i will start the ball rolling . I have the following BOSS 351 engine blocks, ... I Also have 1F173943 i have the marti report on this car its a , white boss 351 that was out of the dallas ordering district. I bought this block off ebay a couple years ago, the guy i got it from said his father in law ? bought the block in New Braunfels Texas i think he said in 1976"
He wanted to hold onto my block because it was very close to his own Boss 351's VIN. After some considerable time, I convinced him the block needed to be reunited with the car it came in. So now I have it! It needs some work but I have it with the car. How the block was separated in 1976 (or earlier) is unknown. Also - why and when did block go from Oklahoma to New Braunfels, TX (near San Antonio)? BTW the guy I bought it from lived in the virtually desolate middle of Nebraska!!!!!! Crazy! And yes I saw where I missed it being listed and sold on Ebay!!!!!! UGH. There is more info but that is a good part of my car's history. I've also been in contact with the 2nd owner (Minn) who had her from 1987 - 1998 and he did send me pics of when the stang was restored in 1990. 3rd owner was from Kentucky. So being the 4th owner, Christine has made it from California to New Jersey. I have a complete history on my car from the day it was bought and have been in contact with all but one owner since about 2001. Most of the information I have came from the second owner and a friend to the first owner who unfortunately passed away in 2009. It's a very cool story. When I found this car, it was advertised on Hemmings website, so I emailed the seller. To my surprise, he emailed back to say the car was still for sale, but unfortunately did not confirm the asking price as I had asked. When I went back to the Hemmings site the next day, the ad was gone. It had actually timed out so I was unable to get a copy of the ad that reflected a low asking price which would come back to bite me. Not going into that little detail right now though! I actually flew out to LA to see the car first hand and was pleasantly surprised to find the car exactly as described. After buying the car and spending a weekend with "Tony", we are still in contact today. He was the 5th owner. After shipping the car back to Canada, I got interested in the history, why I'm not sure, but I contacted the California DMV. After submitting the forms and paying the fee, I received a list of all owners names but no addresses. "Tony" was able to give me some details about who he bought it from and after a bit of searching, I came up with his email and eventually got more info. He was able to tell me that when he bought the car in or about 2003, it was untouched and totally original body wise and numbers matching. This owner did do some work on it with a new paint job in the original Light Pewter as well as new seat covers, magnum 500's and a stripe kit. Apart from that not much else was touched. The first pic is how I first saw it in LA. On the list I received, the first name was that of a lady, the original owner. Now, this car was not your typical Lady driver car being a 351C 4V, 4 speed, no power steering, no power brakes and drums all around. A true muscle car! Not long after contacting the 4th owner and sharing the DMV list, he emailed to say he had seen an obituary for a lady of the same name. Could she have been the original owner? I respectfully sent an email to a contact named in the obituary and eventually received an email from the friend, the second owner. I'll not going into every detail, but in short, the car was a graduation present and she owned it for about 30 years before selling it. Number 2 had it for about 2 years, then sold it to a friend, #3 who only had the car for about 6 months and was the one I could not contact. So, if you followed all of that, I'm the 6th owner and had the car for almost 10 years. Here are 2 pictures, as I bought it and as it is today, not a lot of difference looking at it but a lot of cash invested since. I too have the original license plates and plate holders from the selling dealership in Santa Rosa CA.